Innovation in systems, services and technology is necessary to meet TenneTs challenges in the energy market. For us, innovation is about successfully exploiting new ideas to create value for TenneT and society. To plan for the future we seek innovation with other stakeholders, such as contractors and cable suppliers, especially as demands increase to lay cables underground. As we explore innovations in this area, we aim to cause as little disruption for the environment and local residents as possible, while also realising projects more quickly. Horizontal drilling over longer distances could be a solution, with the possibility to drill distances of five or more kilometres for our high voltage grid. We are now cooperating with contractors and cable suppliers to make this innovation a reality. As work on our assets becomes essential to secure supply and future-proof our infrastructure, we face the challenge of working with live installations, also known as ‘Energised Working’. In the Netherlands this is prohibited by law, although the practice is permitted in other European countries. However, given the importance of the availability of the high-voltage grid and the complexity of electricity supply as a result of the energy transition, it is increasingly difficult to switch off the operating voltage when we need to perform work. As a result, it has become difficult to maintain certain parts of the grid or to do so on time. Energised Working offers a safe alternative and does not pose greater risks than working on disconnected installations. 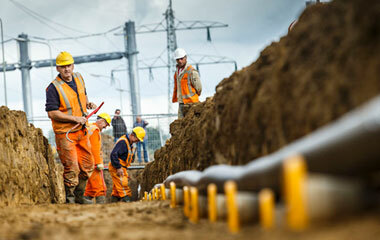 To explore this further, TenneT collaborated with its partners. In the future, decentralised energy sources will become increasingly important to maintain the balance between the supply and demand for electricity. To explore this, TenneT is undertaking a pilot project in collaboration with seven market parties: Engie, Enova, Escozon & Energie Samen, Next Kraftwerke & Jedlix, Scholt Energy & Enervalis, Sympower and Vandebron. This is a follow-up to a previous collaboration with Vandebron and uses blockchain software to manage transactions for electricity demand and supply. To model how electricity can be supplied from a growing number of sources, the project partners will apply a software management tool to energy sources including wind, solar, combined heat and power (CHP), heating grids, electric cars, electric boilers and electric pumps. During the pilot project, new data communication technologies will be tested to enable TenneT and suppliers of flexible generating capacity to exchange the required information for balance maintenance purposes. TenneT and other industry players are engaged in a pilot project in Germany called Element Eins, to bring green hydrogen solutions to market. TenneT is joining forces with the gas transport network operators Gasunie and Thyssennet to jointly build a power-to-gas installation with a capacity of 100 MW. Upon completion in 2022, this facility will be the largest power-to-gas installation in Germany. 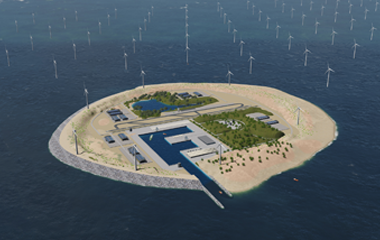 It will be constructed near a TenneT transformer station in Lower Saxony, where electricity from offshore wind turbines is distributed. Commitment to nature, working on positive nature measures in our projects and operation is resulting in more and more initiatives. One of them is the transformation of gravel areas near our stations into green areas, providing this is possible concerning our operation. Our stations, which are unmanned, are an excellent location for biodiversity and can serve as connecting hubs for biodiversity in the area. A pilot executed by the Vlinderstichting showed excellent results with respect to increase of insects and pollinators. The first pilot in Hengelo has started where we looked how transform a piece of land, which actually not being used. The pilot will be further executed during 2019 and we hope to see some results. With the ongoing offshore grid expansion, consisting of platforms and cables offshore, TenneT also has an increasing ecological impact during the realisation and operation of the offshore grid. To reduce this impact we have started a re-assessment of the standardised offshore grid concept in terms of opportunities for nature enhancement and further ecological monitoring and contribution to knowledge increase. Whereas cost reduction is still an important driver, additionally the idea of using the offshore grid infrastructure to realise opportunities to increase nature diversity and to achieve additional societal benefits has evolved. Nature Inclusive Design implies ecology-friendly measures are integrated in the offshore grid design, as a basic condition. The ultimate objective is to enhance nature inclusive design as an incremental part of the technical design and (spatial) planning/licensing phase of the offshore grid. TenneT participates as project partner in three innovative energy projects in Northern and Southern Germany, which are part of the „Schaufenster intelligente Energie – Digitale Agenda für die Energiewende“ funding programme of the Federal Ministry of Economics and Energy (Wirtschaft und Energie). The "shop-window" projects are intended to provide insights into safe and efficient system integration, especially of wind and solar power. In the three projects, TenneT aims to find the best ways to improve the interplay between generation, consumption, storage and networks. The aim is to ensure that the power grid in Germany can continue to operate safely even with a high proportion of renewable energies.